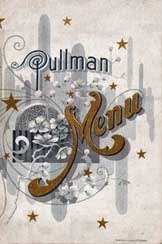 It’s time for a delectable dinner--- On Saturday, August 10, 2013, make your way, through our local architectural gem, Washington's Union Station, to the Dover Harbor, our 90-year old luxury Pullman railcar. Waiting on the tracks of the station the Dover Harbor will host the 2013 edition of Chefs’ Table. Our chefs will work together to provide you with a sumptuous tasting menu, served by our white-coated and attentive stewards. Eight courses, a sampling of small servings of our newest and favorite recipes, using local fresh seasonal foodstuffs, artisanal specialties and chef’s whim. A new selection of wines will accompany this year’s menu. To start, a surprising amuse bouche…a single bite-sized hors d’ouevre accompanied by a designer cocktail. A rich soup will be followed by the appetizer course. Next up, fresh seafood and a chef's selection of an outstanding white wine. Following the salad, the meat course will be paired with a deep red wine. A cheese course will be next with a sampling of various gourmet cheeses and accompanied by a glass of aged ruby port. Coffee signals the end of the meal but for the “coupe finale,” a sweet ending to the meal. Two extended seatings are being offered to allow you to enjoy this multi-course meal to the fullest. Choose between a late afternoon Saturday dinner at 5:00PM or an evening meal at 7:45PM. Please make your reservations early-- this special event is bound to sell out! RESERVE/BUY ONLINE NOW at www.dcnrhs.org. 2. No refund or credit of purchased tickets after July 10, 2013, other than by operator's cancellation of the trip or reselling of the space. Online reservation handling fees are not refundable. 4. The Washington D.C. Chapter, NRHS makes every effort to accommodate the physically challenged; however, Dover Harbor as a historic railroad car is not wheelchair accessible. Operator requires those passengers requiring special assistance from others to travel with someone who is ableto assist them.